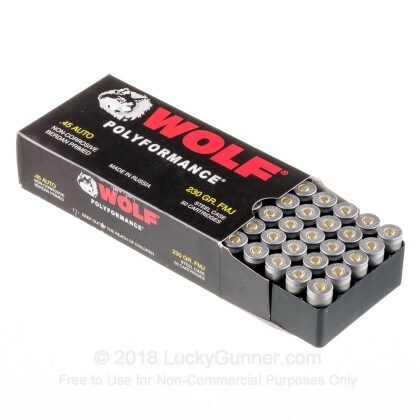 Newly manufactured Wolf WPA Polyformance (50 rounds per box). Manufactured in one of Wolf's legendary production facilities in Russia. Wolf ammunition is as rugged as the country it comes from. 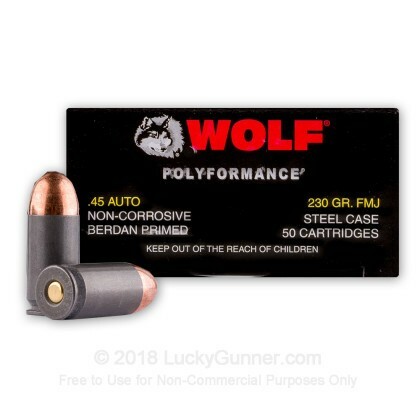 If you're looking for a great value in a steel-cased 45 ACP round, you've found it with Wolf WPA. This stuff performs great under all conditions. From the frozen Russian Tundra to the African Serengeti to your neighborhood range, this ammo does it all and does it well thanks to its polymer coating that ensures smooth feeding and extraction. Works fine in my Paraordnance P14-45. Goes bang and I police up cases with a magnet. Suitable for practice. Always Quick Shipping along with great Ammo products with a large selection on Hand-Have not had any Back Orders as of Yet with this Company! The 45 acp Ammo fires Awesomely! Very dirty ammo, causes firearm to malfunction after a short time of heavy usage. When I use boxer primed, the firearm works much better. Using a Glock 30.
my Ruger 1911 runs them flawlessly, not one issue so far out of the 200 I've sent down range......will not hesitate to buy more soon! A little flare up and particles when firing because of the type of casing but other then that great. Not as good as Tula I'd say but good. Steel case is harder to load in the mags but it goes bang every time. The ammo is very dirty , you must clean your gun. The price is right and it works. 5 STARS. I have a new Rock Island Tactical II and had about 20% failure to feed ( round not fully chambered.) Had tro give it a bumb on the slide to fully chamber round. What if it was the time you needed it to stop an intruder and it gave him time to get you first. 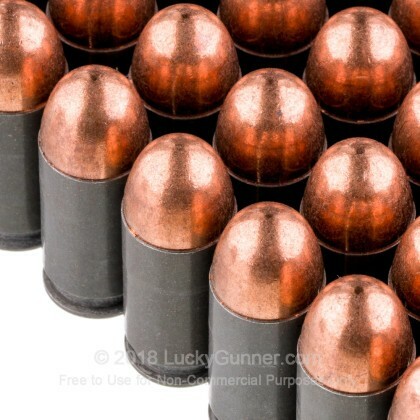 I will not buy any more ammo that is not brass casings. I had about 15 failures to feed(didn't go fully into battery). The problem was fixable by just "forward assisting" the slide but, SERIOUSLY FOLKS, that shouldn't be necessary on a Glock and never has been in over 2000 rounds of Tula. I've also had minor issues in the past with Wolf 9mm. Tula costs a few pennies more per round and is worth it in my opinion. Still, it all went bang so maybe for some people the performance is acceptable in practice ammo. Satisfied for the price. Great target ammo. 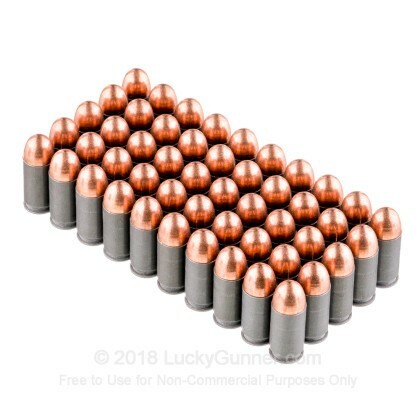 I have put 80 rounds of this through my 1911 so far, and no problems! And it's hard to beat the price. 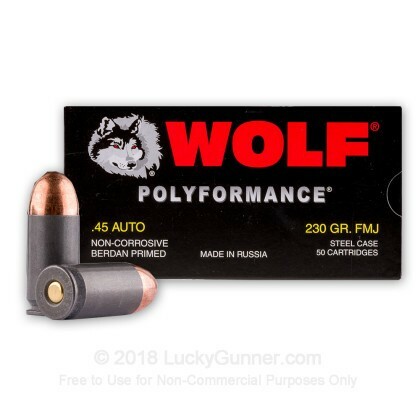 I purchase 45 ACP to try out the Wolf brand for the first time. I went to the Gun Range and Fired them with no problems. I'll be buying more of these from your Co. soon. although the ammo was a little dirty, it is a good choice to practice with. the performance was ok had a couple jams in 50 rounds, I think because of the dirty powder. Makes for extra work when cleaning. I would use again if it were the only ammo available. 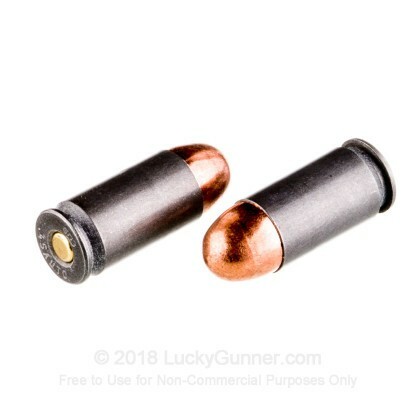 Basically good back up ammo if yer out of the good stuff. Not bad ammo for last ditch efforts. Powder is a little dirty when cleaning. Cycle's great.... even in my Glock. All rounds fired off pretty well except 1out of 50. Dirty though. We also have this 45 ACP - 230 Grain FMJ - Wolf WPA - 500 Rounds ammo in stock in a bigger quantity.